Description: The Yearbook Team is conducting a student contest to create the front cover art for the 2018-2019 Regnart Yearbook! The winning artwork will appear on this year's Yearbook cover. 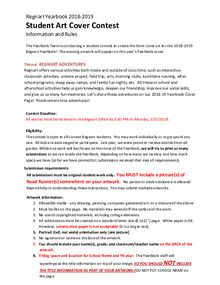 Regnart offers various activities both inside and outside of class time, such as interactive classroom activities, science project, field trip, arts, morning clubs, lunchtime running, after-school programs, sleep away camps, and family fun nights, etc. All these in-school and afterschool activities help us gain knowledge, deepen our friendship, improve our social skills, and give us so many fun memories. Let's share these adventures on our 2018-19 Yearbook Cover Page! Roadrunners love adventures! All entries must be received in the Regnart Office by 3:30 PM on Monday, 2/25/2019. Download "2018-2019 Yearbook Cover Contest Flyer"